HOME DZINE Home Improvement | What is a stretch ceiling? Stretch ceilings have been around sine the time when a wet cloth was stretched and dried to create a false ceiling. While the technique is very similar, todays stretch ceilings consist of a suspended ceiling system that uses a lightweight PVC membrane and a track. The PVC membrane is stretched and clipped into the track to provide a perfectly flawless ceiling. According to All-In-Plaster, easy to install, stretch ceilings are ideal for hiding imperfections on ceilings and walls and can be used to create uniquely beautiful interior. 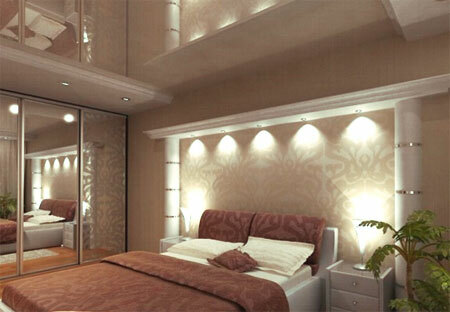 A stretch ceiling is fitted over the existing ceiling - so no major hassle or fuss for installation. The look and feel of the stretch ceiling simply cannot be compared to that of ordinary ceiling; it gives you the finest look and perfection that cannot be achieved with any other ceiling systems. Stretch ceilings allow the incorporation of all types of light fixtures, grilles and fixing points by the use of a proprietary background support. A stretch ceiling offers a perfectly level surface that is absolutely free of imperfections and offers endless design possibilities with the ability to print on the membrane. With a 10-year guarantee you can look forward to a ceiling that won't peel, flake or stain, and will not require any painting. 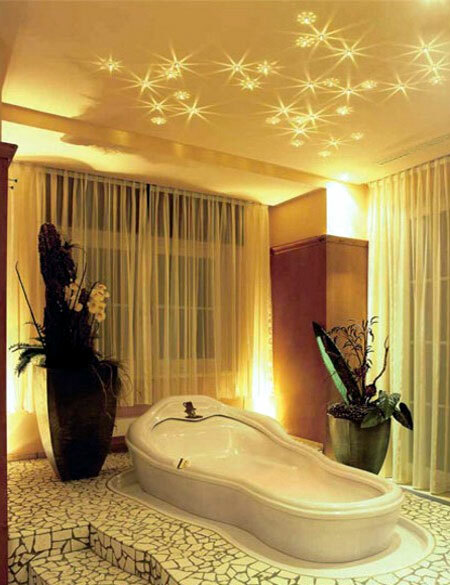 Moisture and algae resistant: Hygiene and cleanliness are paramount in a bathroom ceiling, as is the ability of the bathroom ceiling to cope with a damp environment. 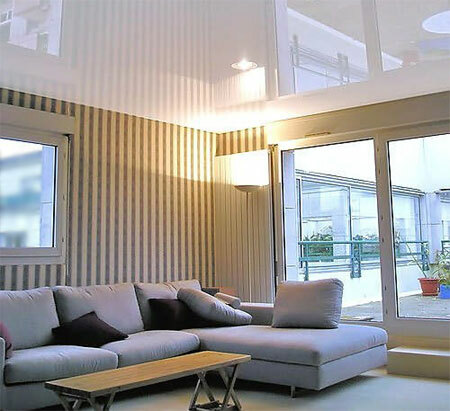 Stretch ceilings are suitable for wet environments and are excellent moisture barriers. They provide effective and lasting protection to the structure above them, do not crumble, and offer effortless maintenance. Perfect in your kitchen: The ideal kitchen ceiling is easy to clean and allows for simple installation of new lighting fixtures, ventilation or air conditioning systems. 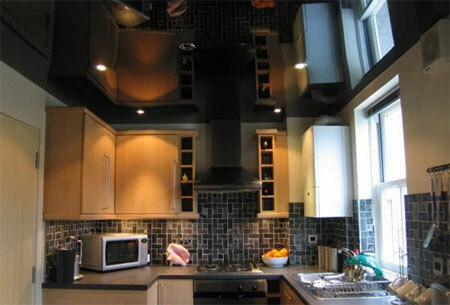 In your kitchen, you want a ceiling that's practical and hygienic - which is exactly what stretch ceilings provide. Stretch ceilings are remarkable in the simplicity and efficiency of the installation (only few hours is needed depending on room size). Installation is not a messy or dusty procedure, there is no need to remove furniture from the room, the only requirement is free access to the perimeter of the room. Generally, installation in an average size room (about 20m2) is completed within 2-3 hours. White or colourfed, plain or design - a stretch ceiling offers all these possibilities and more. Minimum maintenance is required, and in rooms where cleaning may be necessary (such as a kitchen), the ceiling can be cleaned if necessary. The fact that stretch ceilings are plastic means that water does no harm, and using a soft microfiber cloth with mild soap, makes cleaning easy. Stretch ceilings are primarily designed for interior use and for environments where there are no risks of damage by using sharp objects that could perforate its thin membrane. They could, however, also be used for outbuildings such as pergolas, lapas, etc. 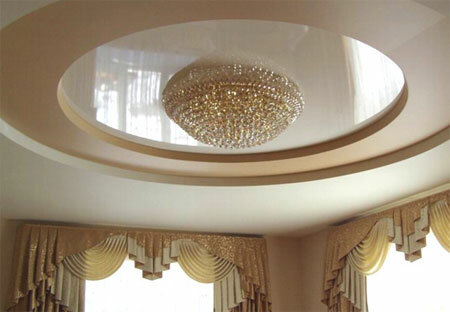 In general, the applications of stretch ceiling are only limited by a few guidelines and your imagination. For a supplier or installer in your area, Google 'Stretch Ceiling"